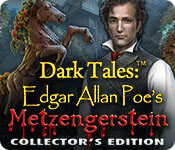 Dark Tales: Edgar Allan Poe's Metzengerstein Collector's Edition is rated 3.5 out of 5 by 35. Rated 5 out of 5 by Kimmiechunga from Love I love all games that have anything to do with Edgar Allen Poe! This particular game is one of the best, from graphics to challenge level to story. I was always thinking and looking for the answers. I really enjoyed this game and would recommend to anyone. I especially enjoyed the end of the game - no spoilers :)- I also really loved that you are able to pick your own responses and that you have some choice and are not stuck with the standard dialog. Overall fantastic game. Rated 5 out of 5 by skullfun from Restore the Metzengerstein line and banish a spirit in this extraordinary edition!!! Wow! This edition really raises the bar for the entire Dark Tales Series. The story starts with the main character taking a trip to Hungary, where the Metzengerstein royal family needs your help. As it happens, the sole heir is being tormented by some kind of fog spirit, and you are the only one who can help. Equipped with all sorts of devices and tricks, you set out to find out more about the ghost and maybe find a way to get rid of it once and for all. It’s the 19th century, and you’ve been summoned together with Detective Dupin by the influential Metzengerstein family of Budapest. The case – their daughter Federica is being terrorized by an unidentified individual who masquerades as a ghost with a fog in tow. Just when you think nothing could be more eerie than the case, you uncover a story of forbidden love that set the wheels turning in this exciting addition to the series. The game begins with a slightly lengthy introductory cut scene that shows Federica almost kidnapped by the man-ghost wearing a bird mask and surrounded by a purple fog, only to be rescued by a shotgun-toting person wearing a skull mask and a hat. After that, you plunge into the game proper. What a plunge it is indeed! 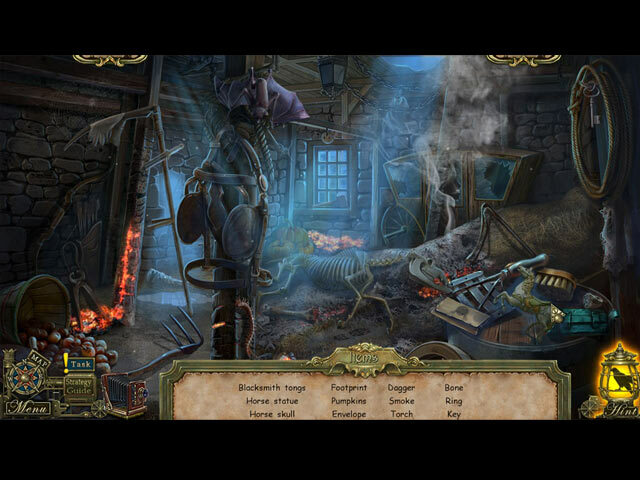 The Hidden object puzzles in this game are remarkable. Your first ever puzzle also doubles as a narrative device – it’s a diary by the Metzengerstein daughter detailing her misgivings and the story of her unfulfilled love for a man named Wilhelm, whose family her father believes is cursed. The text in the diary is used as the clue to find out which object you’ll be looking for in the puzzle. 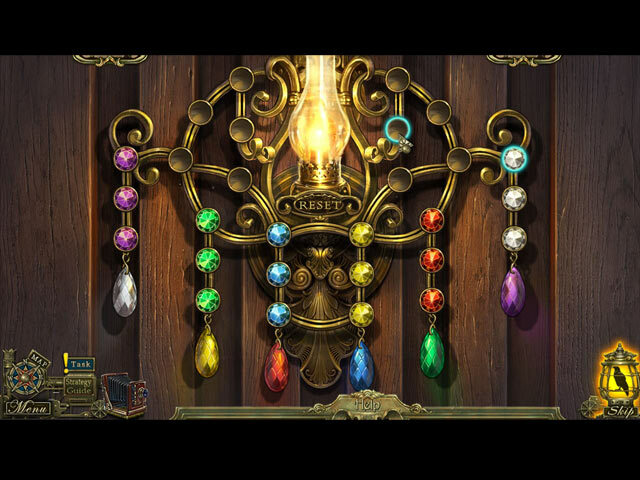 The game also includes a unique feature – it allows you to photograph some scenes in order to reveal clues that will help solve a nearby puzzle. For instance, you take a photograph of the box containing Federica’s diary to find out what the code is so you can unlock it. I was super impressed by this game for it's unique story and fantastic graphics, sound/SFX and spot on voice acting. I highly recommend this game and give it 5 stars across the board. Thank you Big Fish for continuing this series. I haven't enjoyed a spooky thriller like this in a long time!!! . ? Rated 5 out of 5 by kateblue222 from Gloomy, but fun enough The art is sharp and appropriate but gloomy The music, I cannot even remember, though it was not turned off. I did not notice it. I did, however, play all but 4 minutes of the demo without noticing how long I was playing. Basically, I got sucked into the gameplay. That's the mark of a really good game, to me. So to me it is a five star game. Even though I agree with other reviewers that there is nothing new or particularly special here, being entertained without getting stuck or thinking "well that was stupid." Try it. You might agree. Rated 5 out of 5 by kdblueey from LOVE ALL THE DARK TALES GAMES Several months ago, I got the chance to play this game, but I can't recall if it was a CE or an SE version. All I know is that I LOVED it, and couldn't wait until it's release. It has everything the other 'Dark Tales' stories has: an interactive map that not only transports you but closes off scenes once you've completed them. Fun interactive HOS, and not so hard (at least in the demo) mini-games and puzzles. I don't usually buy CE's, as they are too expensive, plus I can do without all of the extras. But I just couldn't wait until the SE version comes out, so I immediately purchased this game. If you like the other Dark Tales games, you'll like this one just as much, possibly a little bit more. Enjoy! Rated 5 out of 5 by diamondgirlva from Enjoyable New Entry in the Dark Tales Series I really enjoyed this latest entry in the Series featuring Edgar Allen Poe's Dupin. 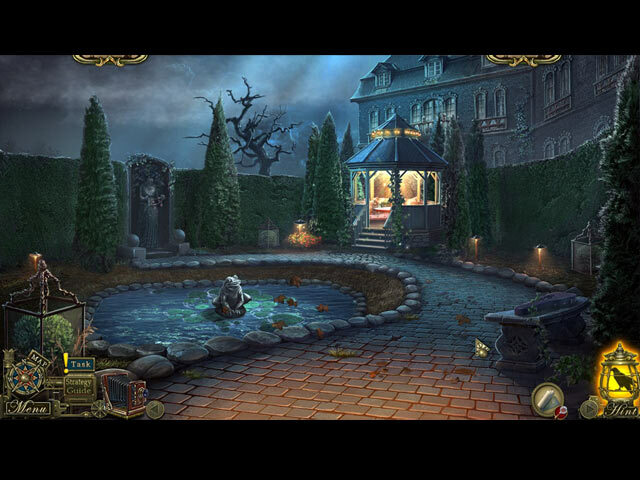 The puzzles were not TOO challenging and the HO scenes were not over used in the game. The story line is interesting and not one of Poe's that I was familiar with which made for a nice change of pace. I liked the fact that we weren't chasing morphing objects and only had one set of collectibles to deal with in the game. I do believe it is suitable for all skill sets from beginner to advanced. I highly recommend to give this game a try and see for your self. Rated 5 out of 5 by 2cats4u from A Rose by any Name... Even though I can't pronounce the name, I loved the game! I've been waiting to finish playing since I had the chance to start this in Beta testing. I was thrilled from the start. For me it seems that ERS very seldom lets me down. I may stumble over the family name but I sure didn't stumble over great puzzles and intriguing story line. Hope you enjoy this game as much as I did! Rated 4 out of 5 by rpggramma from Good Game, Story! Good game, puzzles, and love story, with a couple of twists. Map is good. Very few HOs. Puzzles are good, not too difficult. Bonus is good, as well. Areas that are complete are closed down, which is nice. I got ticked over my so-called partner, barking orders at me while he sits on his duff, as usual!! If you like EAPoe, you will like this! Enjoy. Rated 4 out of 5 by Firehorse66 from Good game with long bonus game So important when purchasing a CE is the length of the main game and the length of the bonus game, both of which were pretty good, a lot better than others. The game was fun, not top of the list but better than most. Hops weren't very interactive which I prefer, puzzles were ordinary and not very creative which I like. For games with a lot of chatter this is one of the very few I can tolerate but still has way too much character chatter. So with all that it gets only 4 stars from me. This game has so many series and I'm personally tired of it, but it's a worthy CE for the bonus game length. No collectables which was very odd and I like collecting objects throughout the game. I'd recommend if you get the CE on a deal.